This is a re-post of a post I made on my previous blog. I’ve had this tracking board for over a year now, and still didn’t program it! Sometimes life gets in the way, and my life has kept me busy for the past few years. Now it’s time to start looking at this project seriously again. This board is very large compared to most HAB tracking devices, and depends upon the Arduino UNO board (which means I’ll have to fly that project board with the payload). I will consider building a smaller, less costly version but for now this is what I have. My frustrations got the better of me. I had intended to use my CNC mill to cut a PCB for this tracking module. The christmas vacation had given me time to prepare the schematic in Eagle CAD and to add the limit switches to my mill. Sadly, generating the g-code required by the mill has proven to be a stumbling block. There is software to do it, I just couldn’t make that software work! So with the vacation over its time to accept that there are quicker ways to accomplish the goal. I had previously purchased an arduino shield prototyping board from seeedstudios. 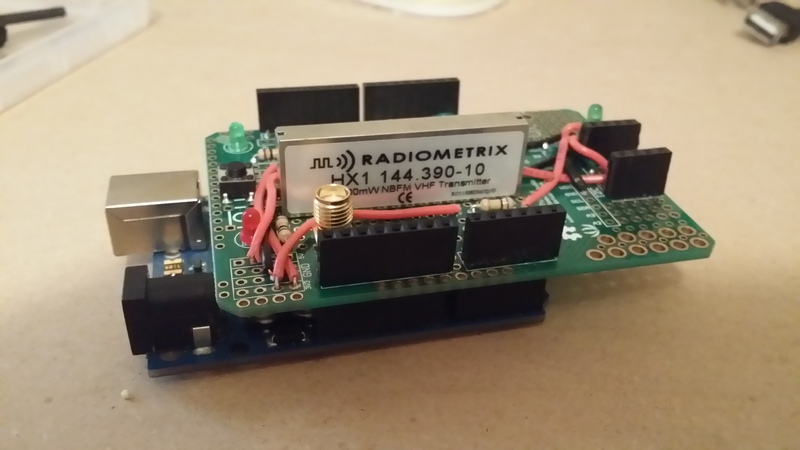 On the board you can see the Radiometrix HX-1 radio transmitter module, which will be used to transmit APRS data on 144.390Mhz. To the right, two header strips are positioned to accept the lassen-IQ connections from the GPS board I blogged in a previous post. To the left (front) you can see the SMA antenna connector which will carry the transmission from the HX-1 to the external antenna. The additional header strips were not required, but I found it useful to attach them for debugging purposes. 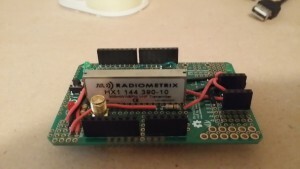 I was able to connect the MAX-232 serial interface (from a previous post) into these headers to test that the radio and GPS devices were communicating correctly. This board uses 3.3v to supply the Lassen-IQ GPS module both as primary power and using the same source for the backup supply. Why? Well I also included a transistor switch to the main power line of the lassen-IQ which enables me to turn the device on and off from the micro-controller. This feature enables me to use differing baud rates for the lassen-IQ and Radiometrix HX-1 while remaining on the same UART. 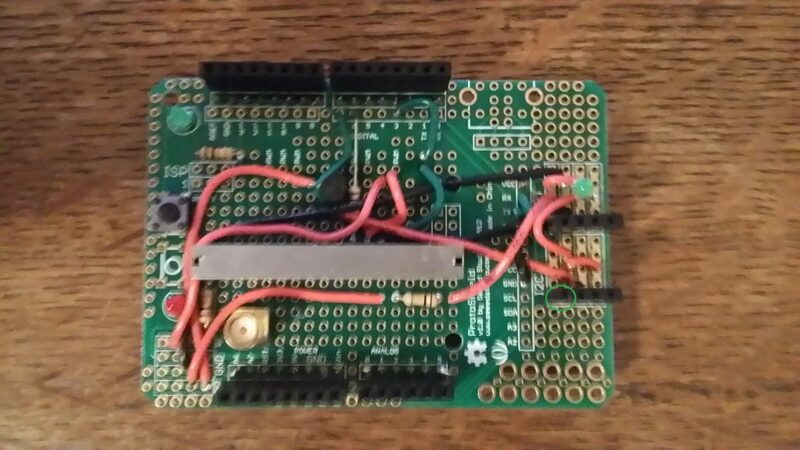 In short, I won’t have to write my own software UART for this board like I did for the PIC based tracking board of the Artemis-1 project. Keeping the backup supply powered will prevent the GPS module from losing its lock (the lassen-IQ is notoriously slow to acquire a lock). I’m able to control the Radiometrix HX-1 enable pin from the micro-controller also, again, saving power between transmissions. The hardware is built and to some degree it is tested. I was able to test the function of the Radio and GPS enable lines, as well as testing that data is received from the GPS device. I was able to test that the radio transmits, although, no data has yet been sent from it. My next step is to write the software which will transmit the APRS data, for which I think I can modify the trackuino code. That US flight is finally beginning to look like a reality!